Alex J. Cavanaugh: Ninaj News, A to Z Minions, Wacky Waddles, Champion in the Darkness, and is Blogging Dying? Ninaj News, A to Z Minions, Wacky Waddles, Champion in the Darkness, and is Blogging Dying? Gypsywoman (a.k.a. Jenean C. Gilstrap) just released a new book, Words Unspoken from Yareah Book Publishers. Congratulations, Jenean! Thanks to everyone who signed up for my CassaStorm Cover Reveal on February 22! The A to Z Challenge list continues to grow – 650 participants now. Don’t forget my Top Ten Movie Countdown Blogfest on March 18! Wednesday Movie Quote is being postponed until next week! Sorry, but I’m taking Wednesday off this week. I’ve finished revisions on CassaStorm and want to go through it once more, so I need some extra time this week. Wednesday Movie Quote will resume on February 20 with a “romantic comedies” quote. Miranda Hardy’s Picture Book Release! 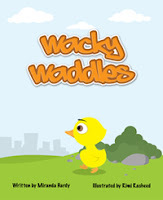 Wacky Waddles is a rhyming picture book for young readers written by Miranda Hardy and illustrated by Rimi Rasheed. You can find their bios at Quixotic Publishing. Wacky Waddles is currently available in print and ebook versions on Amazon, as well as an ebook through Barnes and Noble. I know that question has been bouncing around for a while, but thought it was time I tackled the topic here. Andrew Leon’s post for the IWSG tackled the topic of blog traffic. I read through the comments later and one caught my attention. Not only do I agree with Brandon and Bryan, but that comment could’ve come from me. (Although I don’t think blogging is any smaller or larger than when I began a little over three years ago.) Even my publisher says this blog has made a huge impact on book sales, especially as I am so involved in the community. I’m on Twitter and Goodreads, but I don’t have a Facebook account or a website. I don’t write for a magazine, I don’t post my work elsewhere, and I’m not involved in any forums. This blog is my prime focus. But as far as the rumor that blogging is dying, I don’t think it’s happening either. There is a natural ebb and flow to all things. And while many bloggers have chosen to pull back or give up (and after three years, I could give you quite a list of those who no longer blog) just as many new bloggers have taken their place. People like Livia and Father Dragon Al, who’ve jumped into blogging excited and ready to go. I don’t know about you, but their enthusiasm keeps blogging fresh for me. Maybe that’s why blogging seems to be dying for some people – their circle of blogging friends is shrinking. There are definite spheres of influence in the blogging world as well, and I’ve also been around long enough to watch those circles shift, grow, and fade. Bottom line for me – blogging is not dying. Signed up for all of the events? Are you an A to Z Minion? (There are perks!) Picking up Mirands’s or Tyrean’s new books? And do you think blogging is dying? Captain Ninja!! Your blog's gone all matrix on me!! LOL!! And I love your new look blog header too!! It's all sparkly and flashy! May I tell you a funny (well a little bit amusing!) story? I thought I gained one follower last year and was most pleasantly surprised until I realised that for some reason, I managed to follow my own blog! LOL!! Then I went and un-followed myself and felt really bad! LOL! Blogger will always be around, I think. It may not be as virulent as twitter or FB but it'll be around in one form or other. Hoorah for these new books and your book cover reveal event to come!! I often read that blogging is dying, and then I turn to my Google Reader and start working my way through the 300+ posts in there! So, no... no it isn't. Great post - and I must say (*go on...*) thanks, I must say it's not that I thought blogging was dying ("we need a post, STAT! ")but I was/am worried about too many blogfest going on out there - mine included! I wonder if we've watered down the "coolness" of a blogfest? Which is why I'm trying to get more involved one-on-one via guest interviews and fun getting-to-know-you posts... or is that what everyone did pre-Blogfests. I think that if I ran an anonymous blog I would be more concerned with followers. As it is, I didn't pick up all that many from A to Z last year, and I was surprised at how okay I was with that. Like you said I might not have gained a bunch but I've been able to focus on getting to know the ones I have. Honestly, I don't know how bloggers with a gazillion of followers manage to remain on top of things. I hope to always be able to respond to every comment and get around to the blogs I follow. Blogging isn't dying - it's just more of a commitment than I think people expect. Kitty, that is funny! I think it will be around for a long time to come, in one form or another. Annalisa, that's how I feel!! Mark, there are a lot of blog fests right now. Maybe too many? But it's been ages since I hosted one, which is why I am next month. Before that, people just blogged about stuff and their lives and such - from what I can remember. Heather, it is a challenge to get around to my blogger buddies, and no, can't visit them all. It is a time commitment. But worth it. I can see your point. Though I don't comment on as many or search newer ones out as fervently, I enjoy the tightened community. I enjoy the fact that people are blogging because they want to these days not because they feel they have to or because they want to inflate their numbers to sign with an agent or get that book deal. But I must say, my focus is on my friends, always open to new ones, and blogs that really interest me, filled with personality. A great Monday Post Alex, yes I noticed the swell of the signings of the A to Z. As for is Blogging dying, since starting this new blog I can certainly see a difference, apart from my regulars I get very few comments. Yet I comment on all the people I follow and find new blogs but it does not amount to much. Great post, Alex. You know the state of blogging is definitely on my mind. I'm planning to blog about it too in early March and will include a link to this post. I think you're right that it ebbs and flows and that there are other great bloggers to make friends with when some stop following and/or blogging. Like you, I see blogging as a huge platform to help spread the word about your book when it gets published. It's the connections we make through consistent blogging that makes that happen. So I really think it's a mistake to stop blogging. Although I've heard it, I agree with everyone. My blog has ten to fifty times the audience this year compared to last year and sales to boot. If blogging is dying you could prove it by mine. I don't think Blogging is changing as much as I am. My enthusiasm in the beginning skyrocketed. Now, three years later...I'm caught up more in the commenting. I can't comment on all and I feel bad. You Ninja? I'll always have words for you. I don't think blogging is dying either - all things go through bursts and ebbs and changes. I see fewer people blogging daily - but I never figured out how they did that anyway! :) I've met so many amazing people through blogging - and bought dozens and dozens of great books! Thank you, Alex, for the mention. It's interesting to see the comments on the blogging topic. I'm in total agreement with you, Alex. I don't see it dying. I've started writing my AZ posts. Determined to have them written in advance. I think the blogging bubble may have burst just a bit, but no, I don't think it's dying either. I read ABFTS's comment as well and was impressed. They do an amazing job with their blog. I'd say it's like anything, if you take the easy way (like me, usually) then you get mixed results, but if you go all-in then you'll reap the rewards. Trevor, that's why I focus on my friends. I'm here for them. Natalie, well said! And thank you. Jemi, I only blog daily during the Challenge. Otherwise, there's no way I could do it. Rusty, I've always gone all-in. I agree that there's a natural ebb and flow to these things. I feel that as long as I enjoy reading others' blogs and they enjoy reading mine, then that's what's important. Alex, thank you for sharing your Minions to me... from your list I have a great team. Blogs are not dying, just filtering to the good ones. I started with 12 blogs and have knocked them down to 3 and it's going to be 2 soon... I find I have learned so much from friend's places like yours... it is a lot of hard consistent work. I would prefer to have more comments, but I have found I don't comment enough... anymore. I've been blogging for 7 years, and I think it's stronger than ever. Sure people come and go, but that's the nature of anything. I think MY blog is semi-dying, but only because I haven't been inspired to do many posts in a long time. I manage two or three a month, and that isn't enough to retain readers, other than a few die-hards like you. Thanks for that, by the way! I didn't make the minion list, but that's okay. I can't wait for AtoZ to start. Just signed up for your cover reveal! Have a great day, Alex! At least now when my posts don't get much traffic, I can just tell myself "Blogging is dying," and feel better about the whole thing. I have only been blogging for about a year and a half so I certainly hope it's not dying. Of course I have no frame of reference since I wasn't blogging 5 years ago. Best of luck w/ your final run through on CassaStorm! I do think the blog world is a little slower just because people get busy. I know it happens to me all the time. But, never dying. There are too many friends to let it all go. I think in blogging you get what you give, bottom line. It's a great platform for presenting your work and your social side at the same time. I don't think blogging is on its way out. I think it's a great platform for the people who put time into it. I am so excited for Miranda!! They've talked about how blogging is dying for the last five years. Overall, blogging has changed. Businesses and corporations have stopped blogging and switched to Twitter and FB. Why? Because it's easier. Good blogging is not dying. The number of new blogs has dramatically dropped off in the last five years or so, but that doesn't effect effective blogs. oooh - there're flashy bits at the top of your blog... So that's what Tyrean looks like! It's always nice to know what our cyber friends look like (smile). Things to sign up for...better get moving. And, no, I don't think blogging is dying. Actually most of the posts I follow are getting more interesting! I signed up to be a minion this weekend, I think it will be fun. I've never been a minion before! I don't think blogging is dying at all, or at least I certainly hope it isn't. It is by far my favorite type of social media. Amen. You can't just make posts and complain that people aren't coming to you. You have to be accessible and you have to be involved in the blogging community. If your circle shrinks, reach out and expand. Make a new circle. There's always new ways to expand your reach in blogging. Thanks for the awesome shout out Alex!!! I don't think blogging is dying. I think it goes through phases, and to keep it fresh, we need to keep visiting each other and "Make it so." HI Alex - I'm popping in from Tyrean's blog hop--Her new book looks awesome! I admit, I'm not seeing as many followers on my blog. A lot of people comment who don't follow. Is that how it's evolving? The point of view that blogging is dying seems to rest on the assumption that if something has reached a certain peak it is good and healthy for it to remain at that peak forever. More specifically, it fails to take into consideration that blogging peaked the way it did because for a long time it was the best way for literate people to put themselves out there and to reach out to an audience on the internet. One could say for a time it was the only viable way. But since that time other viable formats like Facebook, Tumblr and Twitter have been introduced. So now people have a better choice and will choose the format that best suits them. So people who used to blog but enjoy a shorter, more high speed method of interaction much better will stop blogging and use Twitter. This is natural. Options are good and allow us to find the path that suits us best. Blogging isn't dying, it's settling down to the group that would naturally choose to use it and who are therefore more likely to enjoy it and succeed at it. As far as whether this makes blogging less useful for authors... I think it's always best to use whatever online interaction method you will be most comfortable with. It's all about making yourself available to your audience, but if all your audience sees are stilted, marketing filled Tweets because you as an author just aren't comfortable with the format then you're not helping yourself. On the other hand, if you audience sees engaging, enthusiastic blog posts because that's truly the format you enjoy using then it doesn't matter if they follow you or now. They've seen YOU in your element and had a positive experience with you as a person. That's what counts. I certainly -hope- blogging isn't dying out...I'm just starting to get into it on a regular basis! :) From what I'm seeing, though, I think it's quite the opposite. My reader is exploding as I find more and more new (at least to me) and interesting blogs to follow. I think there's a pretty strong network of bloggers out there and, besides, I think quality trumps quantity in most cases. Madeline, those types of blogs I shuffle to new folders. Jeremy, glad you got some good minions! And you always comment here. One of my favorite peeps! Ted, I'll always stop by! Jackie, some of the other hosts still need minions. And you're right about those who don't post. Shari, you can still sign up! Brandon and Bryan, amen and well put! The circle shrinks, just look for more blogs. Amy, that is odd. Not sure. Very wise words, Alex. I agree, blogging is just ebbing and flowing, as all things do in life. Lots of great news today. Thanks, Alex! I agree with you about the blogging thing. I don't think it's dying, I think it just moves in waves. I notice that my followers accelerate through certain stretches, and then level off. Some of this has to do with my activity in the blogging world. I've seen my comments cycle too, I have a constant group that have stuck with me forever (like you!) and then a new bunch cycles in as others drop off. Priorities and life events shift as you know, so that affects things too. No way is blogging dying. These are people who want to get their names in the news by saying something controversial. As long as people are self publishing or going with a small publisher, blogging will remain a healthy avenue to promote and express one's self and their works. I think, as you say, there's an ebb and flow to this blogging thing. Bloggers come and bloggers go, but I certainly don't think it's dying. There are always new blogs popping up everywhere! congrats to the minions chosen! I think blogging goes up and down depending on how much time people have to devote to it. I know there was a time I would check out new blogs, now I'm content in the ones I follow; I'm sure I'll pick up more with the A/Z challenge though. Blogging is a great way to get and receive information. The way I use blogging has changed, and it'll probably change again. That's life. And that's okay. just when i think, maybe i'll stop blogging, i get new followers. how did i get up to 292 without trying? i have no idea. i like blogging. i don't think it's dying, just maybe not as popular as twitter, or maybe since twitter is the newest thing, we just don't hear much about blogging anymore. i really have no idea. :) glad you're still here. Congrats to all who have new publishing news. No, I don't think blogging is dying, maybe waning from yesteryear but never dying. I love it too much --that's why. I won't let it even if I have to start 100 blogs and comment on them myself. Whoa that's creepy. I agree about the blogging. It's just not as intense as it used to be. And, like you, I'm good with that. For me it's not the number of connections (though that does carry some weight) but the nature of the connections. I met so many awesome people during my first A to Z experience because I continued to visit them and vice versa. That didn't happen last year. I enjoyed your thoughts on blogging, Alex. I do think it helps to provide a strong platform and an interactive home base for writers (not to mention wonderful relationships and information.) Sales *can* follow, although I've not seen as much of a direct correlation, personally. I've been thinking about this blogging thing lately. One thing I've heard is that Tumblr is where to be for writers, especially if you write for teens like I do. I don't know...I feel like I'm just barely getting comfortable with blogging. Sarah, that was beautifully said. It has settled into a habit for those who enjoy it. Mark, that's exactly what I meant - new people are coming on all the time and that keeps it fresh. Waves - I like that, Karen. Corgi, I'm content as well. Michelle, I'm not giving up! Teresa, that would keep you busy. Donna, I met YOU two years ago through the Challenge. And it is the connections that matter. Elizabeth, guess I've been lucky. Evolving - excellent word choice, Mshatch. I agree completely with you. I've seen blogs come and go but I find new blogs all the time. If someone's enthusiasm for blogging has left them they've made that choice. The blog world isnt' dying because someone's small part of it has. Yes, for now we will continue with blogging. I wonder if it's like everything 'new'. At first, everyone has to do it, but with time it reaches a normal flow of things. :) And I thought I was the only wierdo who doesn't do facebook. Congrats to those who have new releases. I don't think blogging is dying. I've seen a lot more visits, but a lot less comments partly because I don't visit as much as I should when I hunkered down editing. The support among bloggers is such that I wouldn't want to quit anyway. I think blogging is definitely slowing down, but I don't think it will ever disappear. When I first started, 2010, it was still relatively new (as far as popularity, not as far as how long since it was invented) and 2011 was probably my best year for traffic. I'd have to check my analytics to know for sure. Blogging and writing are both about endurance. A lot of people lose steam, which is why so many can't finish a novel or keep up with a blog. I'm thankful to have dedicated blog buddies and I hope to continue for many years to come! I don't think blogging is dying. As you said there definitely is an ebb and flow. I see people leave and come back. Some people blog daily, a couple times a week, and some only crank out a few posts a month. Some people are better about reading than posting. I tend to fall into that category sometimes;) And I would rather have 10 consistent readers than 500 readers who were name-only readers, but didn't actually read. I don't think blogging is dying, just going in cycles. I know I get a bit burnt out because it's so important to me that I feel guilty if I don't post MWF. And yet, if I want to get more writing done, then I have to cut back on blogging. I love getting comments and replying to them, but it's the blog hopping that's become so time consuming. The visiting the blog, reading the post and commenting. I love it! But I don't get enough work done. I don't know how you do it, Alex, with a full time job. Congrats to Miranda and Tyrean and YAY for CassaStorm! Lots of great stuff going on right now! I think blogging is alive and well but I do think people are taking a fresh look at how to do it better or with more originality. And I do think most have taken a step back on the amount of time they're willing to invest in it. Good post and thoughts and I agree, Livia and Lovable Dragon are both awesome. I don't think blogging is dying, necessarily, but I do think more people are looking at how to balance blogging with outreach through other forms of social media. I think we'll be seeing more people sort of merge their message across multiple platforms (FB, Twitter, and blogs). I think the stats are padded by the fact that a lot of blogging is done for businesses which don't know how to properly utilize the medium. Have my stats died off? In some ways. But then I haven't had time to put myself into it the way I once did. Besides, the medium has shifted. Twitter when it came out was referred to as micro-blogging, and anyone wanting to see the new generation of bloggers need only take a trip over to tumblr, and get a taste of that teenage blogging angst. The fact that anyone can have a blog (or half dozen if you have a problem like me...) is why it's never really gotten respect. But as someone who started blogging like 12 years ago, to me, that's a main part of the charm of it. Blogging isn't dying. It changes. Evolves and morphs, but doesn't die. My own circle has changed radically as I moved from a flash fiction perspective to writing novels. It was almost starting over again but that's ok too. People you click with will stick around, giving you more of a chance to become close friends. I missed the cover real sign-up day, but am now all sign-up---please tell me you will remind us! I don't think blogging is dying either. People like personal posts and interacting. I think there will be surges and lulls but it will not fade away. Great line-up for your minion team. I don't think blogging blogging is any smaller, I think the luster of novelty has worn off and blogging no longer gets the attention it initially had. Everywhere you look people and businesses are blogging. It's a communication standard now. Have you ever compiled a life soundtrack? First off, I have to agree with you on blogging. If I remember correctly, when I commented on Andrew's blog it went something like I thought the people most vocal about it were Big Five published authors...people who expected others to just come to their blog with no reciprocity. And yes, for them, blogging is dying. I know Nathan Bransford despite having 7000 people or some crazy number following him, his traffic has dropped significantly because he's been complaining about it. I have no idea if my blog has done anything for my book sales. I like to think that it has, but it's not the reason why I blog. No one has told me if my blog has created sales. *shrugs. I continue to follow people via blogger. I try to legitimately follow them, knowing it just won't be for one visit to click follow. I think that's the most challenging aspect of blogging...to continue to invest time in reading what others have to say. But I think it's important. I don't think blogging is dying, but I'm certainly tired of it at this moment. In fact, I'm announcing tomorrow on my blog that I'm cutting back a little. I don't think blogging is dying, although I could see where it might be in some areas. I think it depends on why you're blogging. People like us that use it to connect with other writers, I think it's still going strong. I think people using it as an online diary, or people who are hoping to make a Julie and Julia kind of blog to book deal thing happen have slowed down. All things have cycles--ups and downs--blogging is no different. I've been blogging for over 4 years. I think it also depends upon how you blog-if it's just to harp on one book or what I call hard sell, sure, it gets old. I, for one, don't like to have THE SAME book shoved down my throat. An author is more than one piece of work. You're a creative writer, so be creative with your blog and projecting who you are. Personally, I get frustrated with so many blog hops. I also tend to shy away from 10 blogs on the same day with exactly the same book/blurb/and article. I try to be supportive, but give me something fresh to read on each of the 10 blogs with your book featured. Again, if you are a creative writer, BE creative in your delivery. I still think blogs are an effective promotion platform. Can be a huge one. We just have to remember to keep them fresh and interesting to draw people. Be willing to try new things. Don't know how I missed the sign-up for the cover reveal. That has been remedied! Can't wait. I don't think blogging is dying. I think writers who don't want to blog, but feel as if they have to perpetuate the myth in the hopes that enough people can be convinced that it's coming to an end, lol. I don't think blogging is dying. I think it helps to build camaraderie. I honestly spend more time reading blog posts than writing them because there is really some good stuff out there--professional and personal. I don't think blogging is dying either. In fact, I think it's essential to socializing with people and getting the word out about your books. Ilima, never checked out Tumblr. T, no, there are two of us. Matthew, I know last year was my biggest year. Julie - endurance is a good word for it. Gwen, Ninja skills and clones. But that's why I am taking Wednesday off. Need to finish revisions. TS, twelve years? You win. Laura, did he now? And evolving is an apt description. Holly, thanks - you'll get an email the day before. Michael, I don't think anyone can just post and expect people to show up anymore. Juliana, sometimes you have to. Sia, that's why there's always something different here. I want to keep it fresh. Sia has a good point about over-saturation of blogfests and hops. One has to choose selectively. It's why I don't do tags and awards, too time consuming. I disagree that blogging is dying, it's the bloggers who are going away, the delivery vehicle - the blog - is still alike and kicking. The pace has slowed, as bloggers become more realistic in blending their writing and personal lives. It's like those people hailing the End of the World as we know it. It's not necessarily so. . . I gave Tyrean a shoutout today, as well. As for blogging, I agree completely. I do know I don't visit nearly as many blogs as I used to, choosing instead to stick to the few that impact me more directly. My own traffic has increased dramatically over the last year & for the most part, so have my comments. I do think my blog has some impact on sales, but only modestly. 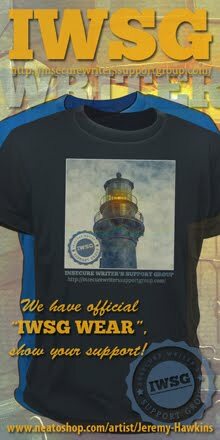 Most of my sales comes from my marketing efforts. I blog now because I enjoy the interaction, though I will admit I have previous little time make the rounds. Congratulations to Tyrean and Miranda! I think blogging isn't as high-profile as it used to be, as many blogs I used to follow years ago are now inactive or deleted, or no longer post as frequently. Quality matters more than quantity. I don't think blogging is dying, either! It's such a great community, and I think as long as people have the time to do it, they will. I don't think blogging is dying. It would be too much. Just when I've started taking it seriously? It would mean that technology hates me and the world doesn't have anything to say anymore. One of these sentences is true. Ok, technology hates me, but blogging is not dying because people have many things to say and share. I agree, blogging isn't dying. I only follow writers, but I hear everyday how many others are joining in, especially public figures. And animals, as in the 4-legged kind. The most famous being Penny the Jack Russell dog and modest internet superstar. Blogs die when the authors lose interest or have narrowed their audience to only a select few. Once I discovered that a blog could be a platform for hops and challenges, in addition to the original premise, it opened up a whole new world for me. Tyrean's book is out?! HURRAY! I've been waiting for it for a long time now! Also, I agree about blogging. I've heard for a long while that it is dying but I've not seen any evidence. Just the usual. Bloggers leaving and new ones joining. Agreed with the blogging thing! I always think it's funny how Klout doesn't hold blogger as that heavy on a sway when I feel like my connections with blogging are deeper and last longer. Silly people! I was told 5 years ago that the mystery was dead(I heard this from a group of agents at a conference). So no, I don't believe anything the so called 'experts' say. Although it sometimes feels as though there's a campaign to convince others it's time to stop. Hi Alex .. blogging will be around for a good few years ... and it's still a very useful tool for many .. I'm a minion for Tina .. but so pleased there are so many minions around .. Kudos to Miranda! I hope blogging never dies. It beats other forms of social media because one gets to actually write. I agree with you and those 'Beer Boys'. I don't think blogging is dying. I do think sometimes we the bloggers get a little burned out and back off some, but I generally come back. For me it's not about followers, commenters or comments. It's all about friends. I think blogging is less trendy than it was years ago, but it's growing, not dying. And I love everything Bryan and Brandon have to say. You too Alex. Congrats to Miranda, Tyrean and all the minions! I also hope that blogging is here to stay. I think the people who worry blogging is dying might also be looking for an excuse to not do it anymore. Maybe, just a thought. As for me, I enjoy it, and when I stop enjoying it, I'll stop doing it. Congrats to Miranda and Tyrean! And I agree with you about blogging. All things come and go, but I believe blogging is here to stay. I don't know where I'd be as an author if I didn't have my blog. DG, it's not the end to either. Nancy, then I appreciate that you always visit me. Carrie-Anne, quality is more important. Thanks, Morgan - working on it. Elana, no worries - not dying! Joylene, and she is a Superstar. Yolanda, we won't believe the propaganda. Hilary, thank you so much for purchasing it. Faraway, I couldn't have said it better. Johanna, it's a good thought. You said it best...but I will add two cents. I think blogging is about building relationships. And people looking to gain new friends, blogging is fun and they will not stop. For people who just want to sell books, the blog isn't fun and they will bale as soon as someone says there is a crack in the boat. Good to hear blogging isn't dying. I'm glad that I didn't hear that six months ago cause I'm not sure I'd have had the guts to start one and now I'm so glad I did!! And yeah, I see evidence every day that blogs reach people. I've heard of/read a TON of books I'd have never been aware of if I didn't follow other people's blogs. I don't think it's peaking anymore like it was a few years ago, but blogging is far from dead! Interesting to hear views regarding blogging, as someone who's only been doing it for (not yet) a year. It's good to hear it's not dead! No, I don't think blogging is dying. Anyone who thinks it is only needs to look at the response you get to every post to see that blogging doesn't have so much as a mild hangover. Congratulations to Tyrean, Miranda and the Minions! Blogging is like gardening, what you nurture grows, what you don't' dies. Congrats to Tyrean on her release! Elizabeth, I'm here for the friends. Tamara, glad you are helping Jeremy. Vik, don't quit - it's not dead. I think Nathan Bransford wrote a post about dying blogs. I don't think one should totally get rid of them, though; yours is a GREAT example of a blog that has been very successful! I volunteered as a minion on another site and am glad to be of service. I don't think blogging is dying at all. It's the best tool in my writer's arsenal too. Wacky Waddles is a great title, by the way! Blogging is certainly not dying for you! Yet, you are an icon of blogdom. But many have emailed me that their own blogs are withering no matter their efforts. I even did a post asking if the blogs of my friends were dying. I gave what hints I could of how to breathe new life into theirs. I don't think blogging is dying but in the context of so many microblogging options like Tumblr and Twitter, I could see why people think that. I am on Team Ninja Minions! Yay! Congratulations to Miranda and Tyrean! With regards to blogging... I'm not too sure if blogging is dying out or not, but I've noticed that new blogs pop up all the time! I believe that input=output and this applies to ANYTHING you do in life... including blogging! I love the blogging community and will be blogging until the day I die! I don't think blogging is dying either. Changing focus, maybe, but not dying. Congratulations to Miranda, Tyrean, and Jenean! I don't think blogging is dying. I do know I have to up my personal time with my fellow bloggers and start utilizing this tool more than others. Have I received the following I want? No. But that takes work that, until recently, I have been unable to do. Can things still change and turn around? You betcha! Clarissa, several hosts still needed minions, so that's cool. Roland, send them my way then. Michelle, it is all about the friendships. Rebecca, not dying at this end. I don't think blogging is dying, but I do see it dwindling a bit. I myself have pulled back a bit, just due to time constraints. Also, with more blogs out there, I don't have time to visit them more than once a week. But I really enjoy blogging and the blogging community so I hope it hangs in there! The only thing I notice, and it's to be expected, is that when I'm not out visiting, which I haven't been much because I'm trying to write this frakking novel, then my blog doesn't get that many visitors. As for blogging dying... hmm, I defintiely think it has changed in the past 3 years. There is no longer an emphasis to blog everyday. Yay. There's always been a need to put in as much as you want out, but after 3 years, those who are still blogging, the enthusiasm and freshness has petered out a smidge. Yes, we are still getting new bloggers and they have lots of enthusiasm, but many of those new ones (not the ones you named) are still learning and don't yet understand the need to be active if they want to grow their following. For myself, blogging is growing harder and harder. While my blog is successful, I see no advancement in my career. The blog was not meant to be my focus. Yes, I've met some amazing and wonderful people through blogging, and I'd never change that. I do, however, need to get back on track with my writing career. Congrats to Jenean, Miranda, and Tyrean! Woot for all three of them. I'm going through final edits, too. Although today, I rewrote 1/2 of chapter 31. I'm glad my editor pointed out the logic flaw. It seemed so minor... turned out not to be. Anyway, no, I don't think blogging is dead. As long as their are writers, there will be blogs. We just have to hop around and keep meeting new people. Blogging is as much a social media as any other. I don't think everybody gets that. They want without giving and we all know the world doesn't work that way. I would not have done so well with my Backworlds series without the push from my friends on the blogs. Glad you were able to get your minions Alex. Blogging isn't dying at all, sorry virtual Grim Reaper. Congrats to all who have books coming out and have a great Wednesday off. Your blog will never be dying! As for mine, not so sure. I have made too many major changes do to lack of having a clue what I was doing when I started. I will keep trudging along until 10 pageviews and 0 comments as well. As you know, my health has been a factor in my blogging and also in my writing. I can see the light at the end of the tunnel though. My husband has finally found a good paying local job. In another month we will have double coverage dental insurance and I can take care of the most pressing issue. Once my health bounces back I will be back and stronger. That said, I'm glad blogging isn't dying. I probably won't be able to do the A through Z this year but maybe next. Wow, so much is going on. Are you going to have cute duckies on your cover, Alex? I love cute duckies. :D (um, not that I'm going to put one on my NA cover. More like hot pecs.). Kelly, I hope YOU hang in there! Lynda, maybe pull back to just one post a week? Mary, I don't think everyone gets that, but it is a social network. Nancy, hope you come back strong. Blogging isn't dying, but running a popular one is an art form. You have the talent for it, Alex, so of course yours will go on for years, which is just fine with me. Sorry I'm late, but I just now signed up for your 2/22 cover reveal. How exciting for you! Wonderful post, as always, Alex. I learn so much from you. Signed up to be a minion - still waiting to find out if I'm needed. Guess I'll hear back in due time. I think blogging is more than a sales tool. It's a way to share information and communicate "socially." I would have stopped blogging a long time ago if I didn't find it helpful to me and a way I could share some of my experience with others. If Blogging is dying my new blog will work extra hard to help revive it non-zombie style. I'm in A-Z, fave movies and your cover reveal. So I'm all in. See you Friday. Congrats on the upcoming book cover release! I checked out Wacky Waddles and Quixotic publishing. Looks like a great children's book. I had no idea anyone thought blogging was dying. Seems alive and well to me as it ever has. I personally have stepped back from it to a degree, as of late, but not because I've noticed others have been doing that. It's just my decision to spend more time writing. Blogging isn't dying. Blogging reaches people of all ages with ideas that really matters and on a scale thats important and unique. In the ol' days we wrote letters, funny how times change. I don't think blogging is dying. People like to chat and discuss too much, whether online or whatever. I have been blogging a long time and I too have seen some blogs disappear, but others have taken their place. Congratulations to all the new authors, sound like some good books to investigate. Helena, not too late at all! Thank you. MJ, I'm sure someone can use you as a minion. Roe, thanks! And don't worry - people like you keep it going. Shaharizan, the cycle of life! Or was that the circle...? Cathy, then just disregard and keep on! Catherine, too much time on their hands? Jo, that's just the way it is. I don't think blogging is dying. In fact, I find myself having to explain it less frequently when it comes up in public. Being a blogger isn't a weird shut-in outsider thing anymore. More and more people I know in real life are starting up blogs, where when I started three years ago I was using a pseudonym and people would ask me if I was worried about "my information getting into the internet"
I'm still on the fence for the top ten blogathon but am leaning toward signing up for it. Is blogging dying? Depends on who you ask. Blogging is what you make it. Point blank, period. Yay for Miranda! I'm so excited for her. As for blogging, I sure hope it's not dying. No matter what, I treasure the relationships I've formed with blogging. Whether or not it'll affect future book sales, I have no idea. I've cut down to posting once a week, though. With a full family life, it freed up more time to focus on my fiction. Blogging is alive and well in my life. It is my favourite social media. It is so much more in depth than FB and Twitter. I think if you give out to the blogging community you will continue to thrive. After a while I tend to avoid 'me' 'me' 'me' blogs, but that leaves plenty of great blogs to visit when time permits. What an interesting post about blogging. I have only been blogging for a couple of years- I can see the ebb and flow. Some bloggers have stopped, but so many have started. I think blogging is a wonderful way to connect with other authors, readers, and interesting people. :) I learn so much from blogging. Champion and Wacky Waddles both sound fun! I gave up blogging for a year, not because I thought blogging was dying, but because I didn't have the time to interact with other bloggers, which frankly, is why I started to blog in the first place. Blogging takes time, effort, and thought, which is why so many bloggers give it up. Some days it's hard. At present I'm on my third blog. My first blog was all flash fiction; the second was a blog for writers; my current blog also deals with writing, but it's more personal. I've seen many changes in the last six years and am no longer the wide-eyed publishing innocent I once was. I don't believe blogging is dying, but like everything else in life it's vulnerable to change and can shift and reshape and become unrecognizable between the beats of a heart. I don't think it's dying at all! I agree that blogging isn't dying. It sure seems to be thriving, actually. Maybe in some circles it has faded? I'm just not familiar with those circles. Blogging can't be dying. I just started getting into it! Just swinging by here to catch up on all the latest, Alex. Can't wait for the AZ and Movie fests. Good points on blogging. I love it...just trying to fine-tune it. It's a delicate balance. I feel like I can never keep up with all the ones I'd like, yours included! It is sad! I can't take part in the my CassaStorm Cover Reveal on February 22 because at that time I'm on a business trip to Spain. But I will post the cover within in my weekend post on 23rd of February. Yeh! I am one of Jeremy's minions! Although I have only been blogging for just over a year, I have had a steady climb in followers, but as I do not have the years before to compare results to, I can only comment on what I know. I think it is still going strong! I haven't seen the interest in blogging drop off on a whole. Some people will re-evaluate their priorities and quit blogging, for a while or forever, but as you say, others start up. I've slowed down on blogging over the past year, I post about once a week which gives me more time to visit blogs and actually write novels. It also allows me to put more effort into each post. I won't be A-Zing myself this year, I've found it just consumes too much time for me and I've a few writing deadlines. I'll stick to my usual routine, but will try to visit many of the A-Zers to cheer them on! I love this post Alex. I don't understand where the "blogging is dying" threat is coming from. Granted, I haven't even been around a year yet, but I think the community around here is pretty strong. Blogging has helped me grow as a writer quite significantly. Nicole, well said. And sign up!! Julie, glad you are on board! Denise, it's my favorite as well. VR, glad you kept coming back to it. Samantha, score one for blogging. Shannon, you refuse to participate in the decline. Edi, that's fine - thank you!! CM, I'm still gaining followers. Love the comment on A Beer for the Shower's blog. I don't think Blogging is dying and from what I have found, it is the people who are uncomfortable or afraid to put themselves out there that are the ones who say things like that. Just an observation. Social media of any kind is huge for small businesses. Can't wait for A to Z! Blogging is like starting a diet; lots of motivation in the beginning. Regarding your minions: I can't see that word anymore without giggling. Despicable Me. I don't think blogging is dying. It is a great way for writers to connect with readers. As for me, blogging has been hit or miss on my two blogs. I have a lot of other things going on right now. Once things calm down, I'll post again more regularly. CONGRATS to all the A to Z minions! Your mention of Wednesday Movie Quote made me think of something - I'm sure the answer is yes, because you're such a movie junkie, but have you played Enscripted? It's on the App Store and SO addictive. You have to use a classic cipher to unscramble movie quotes. I bet you'd love it! I think the blogs that survive longest are the ones that have a purpose rather than just being a form of writing or personal diary. For a writer, especially a published author, it's a wonderful form of networking (and a lot cheaper than attending all those conferences and conventions). I've made so many wonderful friends online that I hope to hang in there for a long time with my blog. Have a productive Wednesday, Alex. PV, you will finish this year! Huntress, that's why I thought term 'Minions' was cool! Patricia, I definitely have a purpose. Wow- lots of great news! Congrats to all! And, Alex, my face is 6 shades of red. How did I miss the call for your cover reveal! I'd be glad to help. I agree with you about the ebb and flow of things, and blogging itself isn't dying, if you ask me! People come and go, just like with anything else! Great observations! I think peeps are simply feeling the blog fatigue. It gets to be another duty on a neverending list. But the rewards are worth it. The genuine relationships and networks built. So even tho I may have very few new followers, I'm still connecting with my friends. Long live blogging! Bloggers unite! I don't think blogging is dying. I think, particularly in the writing world, it's a way for writers to connect with other writers, in an otherwise lonely task and we will always need this kind of space. Like you say, for those who lose momentum and enthusiasm, there is always someone else only just finding their blogging feet. Definitely not dying! I do agree that those saying it are probably not actively involved with it. I would agree that I don't follow as many new blogs as I used to, but that's because I'm invested in maintaining the connections I already have. There simply isn't time to hop around and follow new blogs - wish there was! That's probably the same for a lot who are doing it for a certain amount of time, but things like A-Z do help with making introductions. Blogging allows for more in-depth discussions than Twitter or FB, and I don't think it'll die as long as people enjoy doing that. And dwarves are all excited for the second minion job. I already clarified there will be no raise, though. You know dwarves can get greedy if not kept in check, hahaha. I think blogging won't die. I haven't been blogging long enough to see the trends, but it keeps on expanding and shrinking. You must get involved in a certain blogging community such as this one to gain a following. People don't come to you, you MUST come to them. And you gotta interact and make friends by commenting and following them on other social media. But you must make an EFFORT to make it happen. No effort equals no rewards that you get from blogging. Melissa, that's all right. Thank you! PK, the rewards are certainly worth it. Al, we won't let it die on you. And don't let those dwarves get too demanding. Livia, it all comes down to effort. And people like you keep it fresh for everyone. Blogging like anything else depends on how much we put into it. For some twitter works, others are facebook addicts, etc. Those that claim its dying are probably not hosting a blog that is successful for whatever reason. Enjoy your day off!! I don't feel that blogging is dying, though some have slowed down. Myself included for awhile. Love the cover for "Champion"
I don't think so AT ALL! WE are a tight knit community and very LOYAL to one another. Yes, there are time life gets in he way and we my disappear for while, but we always come back .... at least most of us do. i do it for the writing support, this is the BEST place for it i have found! thanks, alex, for being a huge supporter! Cindy, I second that vote! Michael, and glad YOU came back. Tara, you are an awesome supporter as well! Well, seeing that you have 175 comments on this post in less than a day, I think it's safe to say blogging isn't dead. I agree that it is the best way to really reach people and build writing/reading relationships. Goodreads is pretty awesome, too. And yay Tyrean. Champion in the darkness looks like a great story. It's been hard for me to visit and comment on blogs for the past year or more due to circumstances out of my control. At the same time, I 'm not ready to walk away from blogging just yet. Understandably, I have not gained many knew followers but as I gradually get back into the swing of things, I do hope that will change. Congratulations on finishing your revisions! Can't wait till I can say the same. If you need more volunteers, I could be an A-Z minion! The Wacky Waddle cover is so cute! I think blogging will stay around. It is an interesting discussion to consider. Blogging is still alive and well. Certainly not everyone blogs every day or visits blogs all the time, but it's certainly not what I'd consider an outdated form of correspondence, such as sending mail by horse and carriage. Now, that's old school. Blogging dying? Rubbish! Yes. I concentrate more time on Twitter and Facebook because they're by their nature quicker and easier to use. However, a blog is a window for old, new, and potential readers. I agree its not dying. I know I'm struggling with it now because of my schedule, but I love trolling through the blogosphere and finding great content--on a business, author and personal side. A lot of people are throttling back right now, myself included. That seems to have a ripple effect. But my little corner of the blogosphere won't die off as long as there are gamers and painters out there. Shell, no, it's certainly not dying here! Wendy, you've had a lot of physical challenges. Deniz, some of the other hosts might need one! Anne, Ray and Fran won't let it die! Blogging dying? Gee, I don't know ... I suppose if I blogged to achieve commercial success, I would've shot mine in the head a long time ago ... a mercy killing, if you will ... but I seem to be compelled to offer up stories of my life as an indie author ... whether or not it results in more book sales ... that said, if there were a few more sales, I wouldn't complain, ya know. Like this post a lot Captain Ninja. I don't think blogging is dying, but people are slowly posting less and less often, as life, writing, job, family and other activities intrude into time saved for blogging. But, if one were to go by the number of followers you have and the comments your posts receive, blogging is definitely not dying. There will always be bloggers. Congrats to Tyrean and Miranda! I keep trying to sign up for your A to Z challenge and the sign up page won't load for me. I have had this question myself. I have seen so many blogs come and go. So many people just abandon their blogs and never post again...without explanation. If I ever abandon my blog, I will at least let folks know. However, I think blogging, just like anything takes perseverance. You need to persevere through the down times. Blogging is a great way to get your product out there and it's a great way for people to interact with you. There's no way blogging is dying. It's still popular for a lot of people although less so amongst youngsters who have taken to facebook and twitter. I'm still picking up new followers and finding other blogs to follow. Christopher, I look forward to your weekly posts - don't quit. Rachna, not dying at my end. Terra, I'll look into it. MsMariah, it's sad when a blogger just quits. You know what your talking about Captain! The people who think they know everything and can read the atmosphere often forget that everything goes in waves. Blogging is nowhere dead, dying or sleeping. Some blogs peter out, some stick to only a few, others are gaining steam. Life is all about cycles. I'm so excited for Miranda Hardy. Congrats! I love the name of her picture book--Wacky Waddles. Great alliteration and fabulous cover. Woot Woot! I don't think blogging is dying. It is alive and kicking. What I want more of is comments on my blog. It's hard to write it and not get tons of comments. But it comes and goes. I am glad to be back in blogosphere nonetheless. Blogging isn't dead-people are busy and do what they can, when they can! People are sick-flu, upper resp., and stuff. People are shopping for V-day! Congrats Miranda, Tyrean and Jenean!!! Alex? I think you might have put up a posting. I do notice a lot of flashing on your site. Of course, I mean as in flashing lights! Being rather busy with things that have nothing to do with the world on the other side of my computer, it has taken me a while to visit your site. Delighted to see the alphabet challenge has reached 650. Which means I have even more sites to visit and leave my eagerly sought after comments. And I'm dismayed to read that some folks, I suspect, joined the A to Z to gain 'followers'. I think you know that I believe that it isn't the total number of followers that's necessarily indicative of a site popularity. Interaction amongst a regular group of blogging friends suits me just fine. You see, that's why I can sometimes be cynical about blogfests and blog hops. Nonetheless, those who embrace the ethos of sharing and caring have my utmost respect in all of this. Blogging is not dying. If anything, it grows with the knowledge, the understanding, the sharing we experience. We rejoice in the diversity of an all different, all equal blogging community. We can continue to be a powerful force for the good. I agree that there's an ebb and flow to all things, including blogging. I know in my life, I have pulled back from blogging but come back to it when I can or when I feel the inspiration to reach out to the writer's community. It's a big commitment to blog regularly. I admire people (like you) who do it so effortlessly and generously. BTW, I'm so happy to see all the comments you receive! Keep up the great work, Alex!